Her seductive power, however, did not lie in her looks [...]. 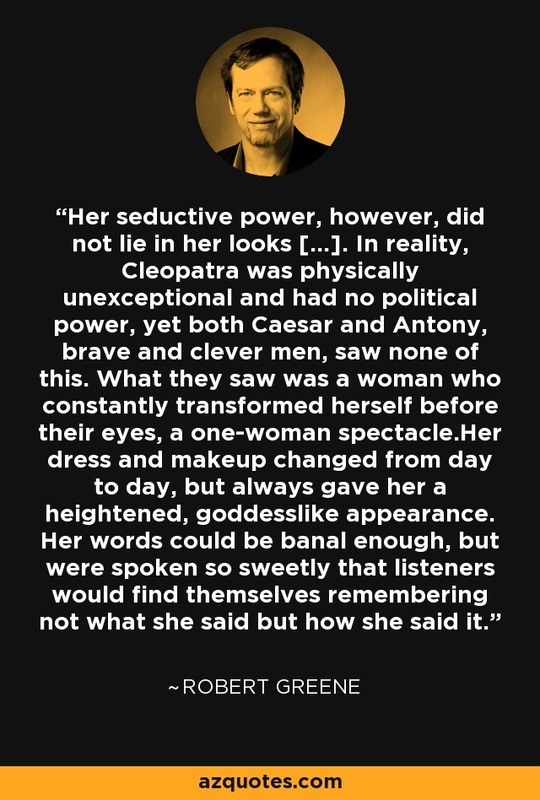 In reality, Cleopatra was physically unexceptional and had no political power, yet both Caesar and Antony, brave and clever men, saw none of this. What they saw was a woman who constantly transformed herself before their eyes, a one-woman spectacle.Her dress and makeup changed from day to day, but always gave her a heightened, goddesslike appearance. Her words could be banal enough, but were spoken so sweetly that listeners would find themselves remembering not what she said but how she said it.